Navigate: StoreFront / Track Car Safety Equipment / Harnesses / TRS Harness "Budget"
Offered as a no frills alternative to the Clubman harness. Available in 3 and 4 point fixing, All with (E) homologation ECE 16.04. Custom colors made on request: Green, Grey, Bright Yellow, Florescent Pink, Orange, Bright Violet) are available through special order. Tech Note: VAC Motorsports advocates safety; please consider the better investment in a 5 or 6 point harness if you plan on regularly tracking your car. 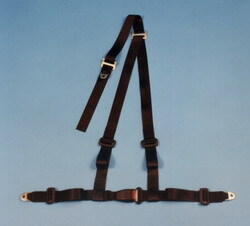 Many groups do not allow the use of a 4 point harness on the track.